Bright Water has a great big propeller. 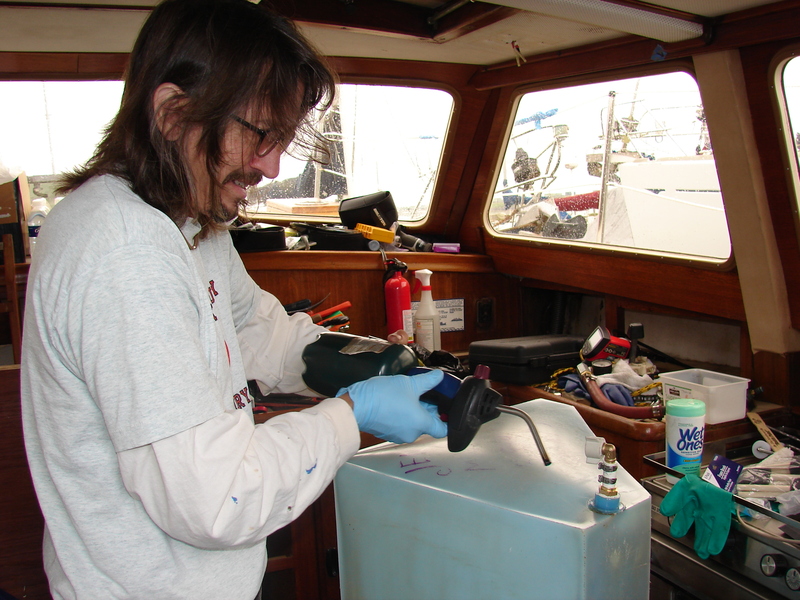 It works great when we’re running the motor- we don’t slow down when we hit waves, we get good economy, and it’s easy to maneuver and back up in marinas. But when we’re sailing, the prop free-wheels. It’s loud and it’s likely that it slows the boat down (think helicopter auto-rotation). So my buddy Jim talked me into trying something we’ve discussed for a long time. We tied four feet of old 7/16″ stayset line to a 5/8″ x 3/4″ teak stick, put the stick over the shaft, and wrapped the line around the 1-1/2″ shaft. We could stop the prop with three wraps. So I put on six and then pulled a loop into the last wrap. The last wrap never drew tight. It worked perfectly on our not-very-windy day up to five knots. We’ll see where the stick snaps. If it works at 12 knots I’ll be surprised. I think that teak stick will snap like a twig. I’d rather have the stick break than something else, though. 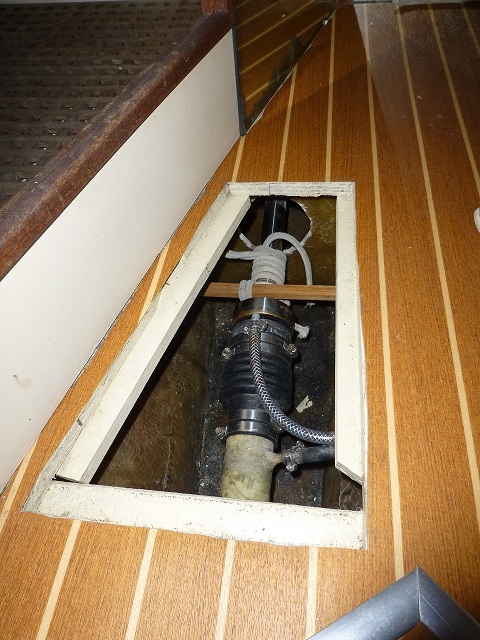 Follow-up: It exploded at 7-8 knots, and the flying pieces threatened to tear the hose fittings off the shaft seal (and, you know, sink the boat). More consideration is required. Perhaps a calculation or two. 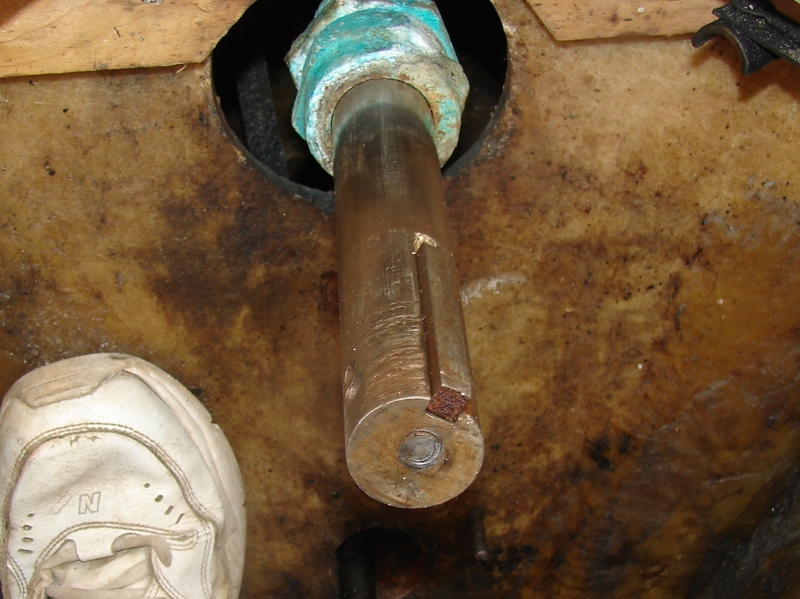 Another issue is that the transmission fluid doesn’t circulate while free-wheeling, and the transmission got up to 150F. That’s 50 degrees hotter than while running, but not too hot. Engine oil runs at 230-250 all the time. 26 inch diameter, 20 inch pitch, same as the old prop. But probably twice the blade area. More push under power, more drag while sailing. 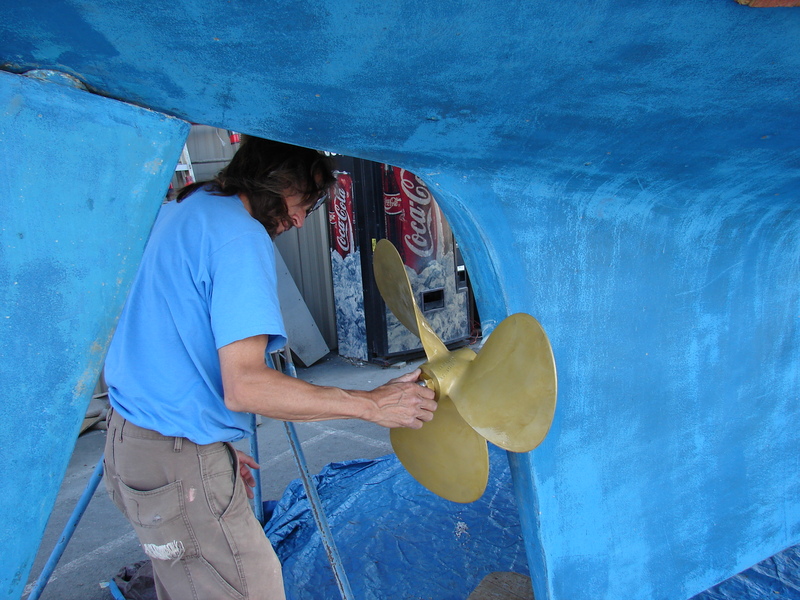 The yellow color is the new Prop-Speed coating, a silicone slippery anti-fouling just for props. Turn the screw, get the shaft. What the heck, we said. Pull the prop. See what we have. Have the shaft inspected. The engine is two weeks late – what else can go wrong? 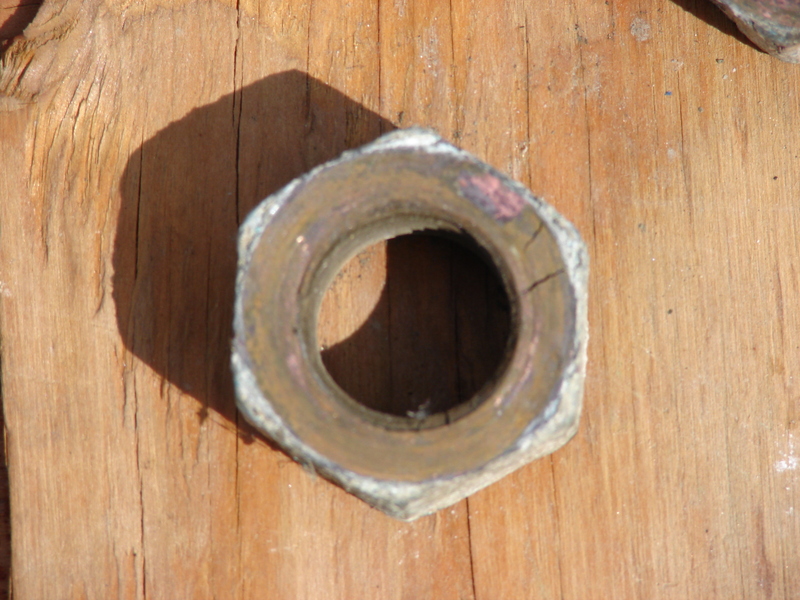 The prop is held on to the stainless steel shaft with two bronze nuts. Rut-roh. Let’s have a closer look. 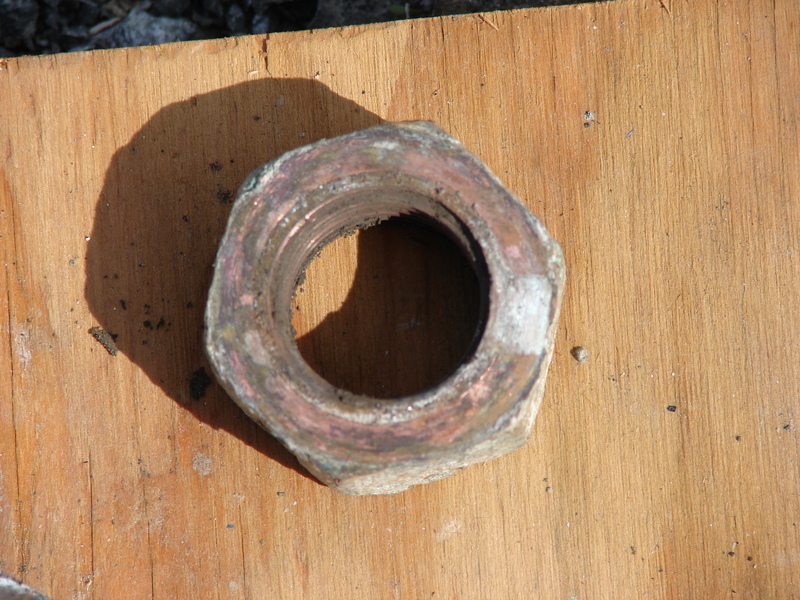 The pink color is where corrosion has eaten the zinc out of the bronze alloy, leaving almost pure copper. Pure copper is much weaker than bronze. I’m sure the other one is fine. The white corrosion at the end of the shaft is easily overlooked in pre-purchase wanderings, but is easy to see once you notice that the prop was about to fall off. Not to worry, though, the shaft was so bent that it had to be replaced anyway. Not a difficult call. The prop is just fine for a forty-year-old bronze museum piece with inadequate galvanic protection. 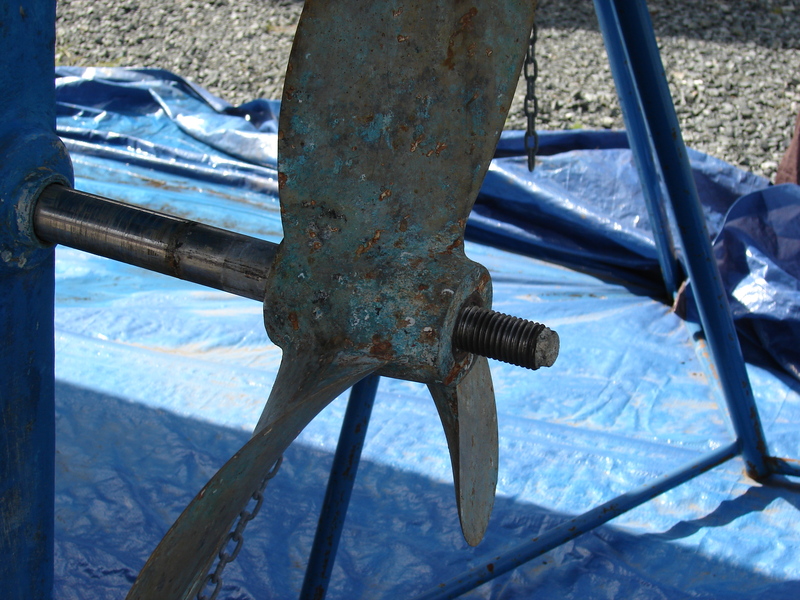 Corrosion and de-zincification is/was superficial. We have defeated our leaking water tanks and we are moving on. Actually, we tried to surrender and buy new tanks, but we couldn’t find any roto-molded tanks that fit and we felt it was more risky to leave with new hand-welded tanks than repaired tanks. For the record, we looked into SS tanks but even the tank manufacturer said they were crazy expensive. So I flame treated and glued the crap out of all the fittings on the tanks. Presto – zero leako. 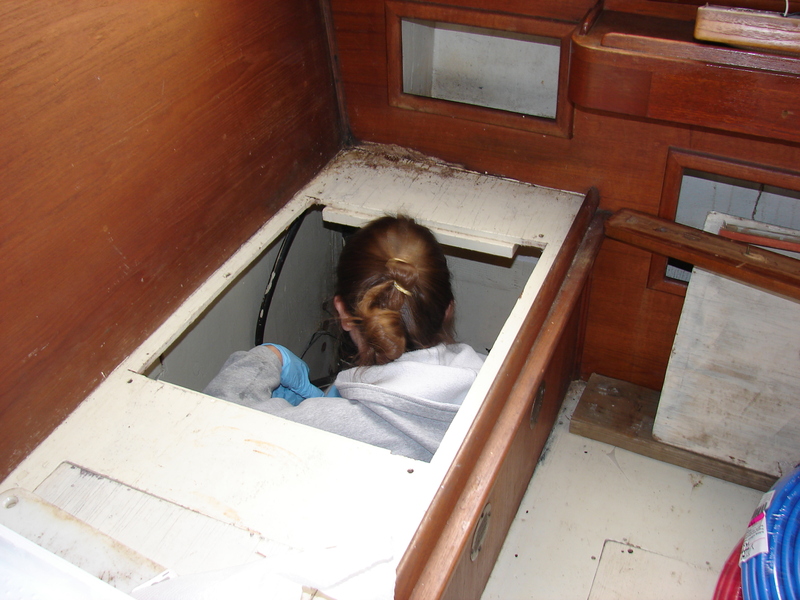 Actually, there was one leak where we nicked the fill line while cutting our access holes. It would have been an easy fix, except water fill line is easily available in 1-1/8 and 1-1/2 inch line, not the 1-1/4 we needed. We forced the 1-1/8 and will look for a better fix. Our friend Larry recommended a good local tank welder, so we ordered new aluminum fuel tanks. Our poly tanks arrived the same day. Anyone want to buy two 99 gallon poly fuel tanks? Nancy continues to clean and paint the nooks and crannies. We just finished installing glass tile on the counter and “backsplash” in the heads before we install new marine heads. We use the best acrylic modified thinset adhesive I’ve ever used and a new epoxy grout to install the glass tiles. 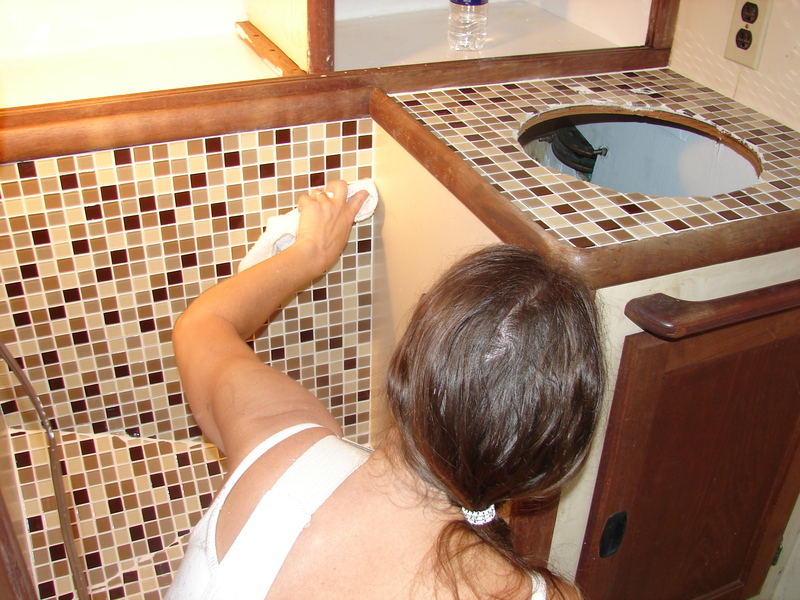 The epoxy grout requires extra detailing as it hardens – no fixing it later with a little vinegar. For those of you that weren’t here in the 1970’s, those are called “earth tones” and the Formica color is called “almond.” You’d think it was cool looking if you listened to a little more Bachman Turner Overdrive and a little less hippy-hop. I finally bought a puller that’s almost big enough and pulled the engine coupling from the shaft. 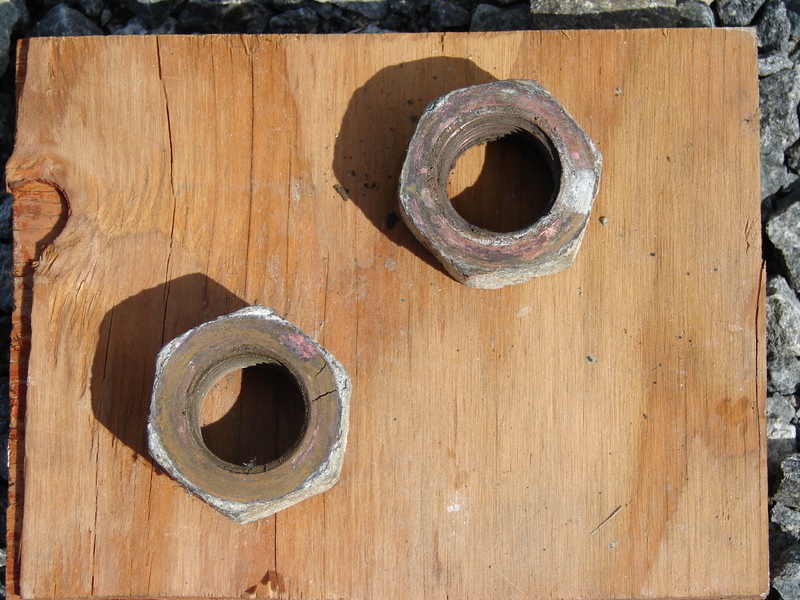 The coupling came off pretty easily, but the result wasn’t pretty. 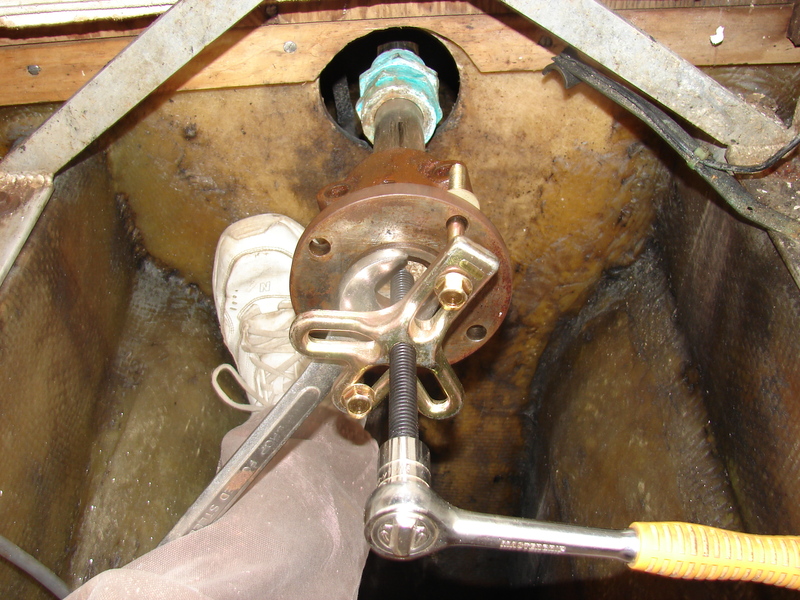 Obviously the coupling has spun on the shaft several times. Ugly. Dunno if it really matters or what to do about it. I assume they cut the keyway after the coupling spun. Any other option is too wacky to consider.